Have you heard about the Yellowstone to Unita Connection or the Western Wildway Priority Wildlife Corridor and the Bear River Range Corridor? What we will talk about today is the critical importance of protecting, maintaining and creating wildlife corridors throughout Utah and the west. Animals and yes plants and all other critters that live in ecosystems, such as birds, insects and amphibians, always suffer when their ecosystem and the ecosystems that are adjoining theirs, either through land or water corridors are fragmented and minimalized, if not lost altogether due to human activities. The ever expanding web of roads and highways, residential and commercial development, intensive agriculture, energy development and off-road vehicle trails in essence trap animals in an ever shrinking island of non-connected ecosystems. Its when species can’t move between ecosystems to mate, migrate, eat, pollinate, find new homes and resources. recycle nutrients, take refuge and more, that inbreeding can cause significant problems for flora and fauna. Sometimes even extinction. 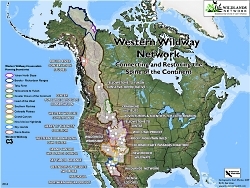 Our politicians and agency folks, as well as developers, farmers and ranchers, businesses and everyday residents can all help to assure that we preserve, maintain and develop a network of these corridors connecting large and small ecosystems running from Canada, through the United States into Mexico. One such large project, called the Spine of the Continent, is a geographic, social and scientific effort to sustain linkages, along the Rocky Mountains, so that plants and animals can keep moving. A local example, the Bear River mountains, located in northern Utah and southern Idaho, is a relatively narrow tract of forest land in the Uninta-Wasatch-Cache National Forest and the Caribou and Targhee National Forests. This mountain range and surrounding basin are a key component of the western United States biological corridor system. The Bear River basin corridor is a critical choke point for species migration in the western United States because it offers the only major link between the northern and the southern Rockies. Or more specifically, the link between the greater Yellowstone ecosystem and the high Unitas wilderness area. We have dedicated organizations working on the protection, expansion and maintenance of wildlife corridors. I mentioned the Yellowstone to Unita connections. They along with the Bear River Watershed Council and others in our state are actively working on wildlife corridors. I spoke to Dr. John Carter, manager of the Yellowstone to Unitas connection about their program. They are doing great work to restore fish and wildlife habitat in the Yellowstone to Unitas corridor, through the application of science, education and advocacy. He invites you to check out their website at www.yellowstoneuintas.org.